A purchase reflect an invoice for goods and/or services you receive from a seller. Purchases have Payments > Purchases remain unpaid until you apply Payment(s) to them. Apply a Payment to a Purchase when you add the Purchase or do this later when you pay funds from the Add > Purchase Payment screen. EXAMPLE: When you have received goods or services you may change the Purchase from “Purchase Order” to “Tax Invoice” by selecting it from the Type drop down list. Type– Specifies the stage the Purchase is at and includes Pre-Quote Opportunities, Quote, Order, Purchase, Simple Money Out, and others depending on your zone. Workflow– Email all Purchase Types as a PDF Print/View as a PDF, Apply second level Contact (Agent/Sales/Delivery), Print as plain paper, Apply Discounts, Mark to be followed up, Mark as sent to Contact. For an organisation registered for GST/VAT. Transaction has taken place between you and the customer. For an organisation not registered for GST/VAT. Transaction has taken place between you and the customer. Goods have not been delivered/manufactured by the supplier. Quick transactions (eg basic expenses where you don’t really track the supplier). Used especially when not much paperwork is involved. A change is required for a Sales/Tax Invoice that has already been issued to you from a supplier. Indicative estimates for creating a sale that may occur but is not yet confirmed as an order or invoice. Mainly used for tracking and managing expense pipeline. Issued for a third party. e.g. issuing commission for a partner or reseller. Issued to you from a supplier informing prices when a request has been made. On this page you’ll provide all the information about your Purchase. You’ll also get a chance to Email, Print, Add Attachments and Activities to the transaction once saved. Type Invoice will be the default selection. Change this to Order or Quote if required. Contact The Contact is the person an the associated organisation you are dealing with. You can add a new contact by clicking the add icon next to the Contact drop down list. Ship to If the shipping/delivery Contact is different you can choose another Contact by clicking the link. Date Enter the date of the Purchase (this isn’t necessarily the date it was paid for but rather the date you agreed to buy some goods or services. Payment is sometimes made on a later date). Invoice # Enter the suppliers Invoice number so you can track their reference. 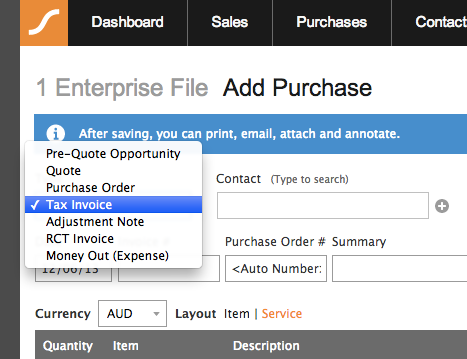 Purchase Order # Either, enter a Purchase Order # or allow Saasu to automatically create this number when saving. Choose Settings > Purchases to change this to Auto-numbering. Summary Include some notes in the summary about the Purchase if required. This might be the suppliers summary information. Due Date Enter a Due Date if you want to track when payment should be made. You can use the links to automatically fill the Due Date with a date in the future. Layout Service will be the default layout. Change this to Item layout by clicking the link if you wish to create an item, time or inventory based Purchase. Amounts include Tax Use this check box to tell Saasu if the amounts you are about to enter include or exclude tax. Service – For each Service enter a description if required. Then select a Account from the drop-down list. Choose a Tax Code and enter the amount. You can add a new Account by clicking the add icon next to the drop-down list. Item – For each Item enter a quantity and Item code or description to select what you will be buying. You can manually add extra information into the Description field if required. Account and Tax Code information is preselected based on the Item setup. Enter or over-ride the unit price if required. Enter a discount if required. The amount should calculate automatically but can be entered if you prefer Saasu to calculate the unit price for you. Date Paid The date the payment was made. Date Cleared The date funds cleared in your bank account. This field is to be used in an upcoming Bank Feeds and Auto-reconciliation feature. Bank Account The Bank Account, Credit Card or other Account used to process the payment. Ref # Your payment reference number provided by the payment system used. Amount The amount paid which may be the entire purchase amount or just an initial payment. More payments can be added later. Tags Apply a Tag to your Purchase if it relates to something particular in your business (e.g. property investments or a division of your business). Requires Follow-up Check the Requires Follow-up check box if you need to put further information into your Purchase at a later date or as it becomes available. Pay Sends you to the payment screen in order to apply a payment to this transaction and others if required. View This option will open a window and load a PDF version of the invoice (or as an adjustment note) suitable for printing. You can print the PDF document from within this window by clicking on the print icon. You can also save the PDF document to your computer by clicking the save icon. Email This option allows you to send a PDF version of the invoice or credit/adjustment note via email. You can preview the invoice before sending. You don’t need to have an email account setup on your computer to do this. The PDF document sent is the same format as that created in the View option above. Use a semi-colon to separate multiple email addresses. PDF Settings This option allows you to specify a logo and other information (such as remittance details) to be included in the invoice. You can specify what the PDF document will look like by clicking the Template link in the Setup section of the main menu. You can add things like Logo’s and remittance information. View/Email as Adjustment Note This option allows you to toggle the invoice format to be an Credit/Adjustment Note rather than a Invoice for refunds, adjustments or returns etc. No Logo Check this box if you wish to view/print without your logo. This is useful when you wish to print to letterhead instead of plain paper. Set a Date, Invoice # (if you have one from your supplier), Summary and a Due date if required. The Purchase Order # will auto number by default. To turn this of and do manual numbering go to Settings > Purchases to do this otherwise you can fill one in but we recommend auto-numbering. Service layout is for general purchases or services. Other options become available after saving such as Attachments which is the ability to upload files against this transaction. e.g. electronic copy of the invoice sent to you from a supplier. You can also add Activities if required such as Call notes, Meeting notes and similar. The Purchase list is used for accessing Purchases you have previously entered in order to view, print, edit, apply payment, or delete them. Use the filters at the top of the screen to select which types of Purchases you want to view between a specified date range. Choose whether you want Purchases to be listed for “– All Contacts –” or choose a specific Contact from the drop-down list. A list of Purchases matching your filters will appear. You can now use the links directly above the list to Add, Pay, View PDF, Delete, List Payments or Export your Purchases/Quotes and Orders. Using the check boxes allows you to perform multiple tasks to these Purchases such as “View PDF” will allow you to view multiple Purchases in Adobe PDF for viewing or printing. Add Add a new Sale. Pay Apply a Payment to the selected (checked) Purchases. View PDF View and/or Print the selected (checked) Purchases from an Adobe PDF file format. Delete Delete the selected (checked) Purchases. List Payments List the payments associated with the selected (checked) Purchases. Export Export the displayed list to CSV file. Include All Tags all records that have the tags selected from the tag cloud in the tag picker. So if tag A AND B is selected then all records that have A AND B assigned to them will be returned. Include Any Tags any records that have the tags selected from the tag cloud in the tag picker. So if tag A AND B is selected then all records that have A OR B assigned to them will be returned. Exclude All Tags all records that have the tags selected from the tag cloud in the tag picker. So if tag A AND B is selected then all records having A AND B assigned to them will be excluded. Exclude Any Tags any records that have the tags selected from the tag cloud in the tag picker. So if tag A AND B is selected then all records having A OR B assigned to them will be excluded. Find payments that have been applied to Purchases. Choose a particular date range and select a specific bank account to look in. To create bulk purchase payment go to Purchase > Tick the Purchases to be paid in bulk > Pay > Select Bank > Save > “Create ABA File“. Can Payments exceed the Purchase Transaction Amount? After you have applied payment to the Purchase you cannot change the total amount of the invoice to less than the total of payments applied. If you have applied payments and you wish to change either of these values you will first need to remove payments for this purchase. How do I edit Purchases or Orders?